We really have come a long way when it comes to computing power in smartphones. These pocket computers we carry in our pockets are more powerful than ever before. In mobile computing systems on chips (SoCs) are popular because of their low power consumption. An SoC integrates a microcontroller (or microprocessor) with peripherals like graphics processing unit (GPU), Wi-Fi module and more. Right now the Apple A11 Bionic system on a chip (SoC) powering the latest iPhones is a thing of marvel. Pitting it against latest Macbook Pro models and the iPhone SoC reigns supreme. What we are saying is that the A11 is more powerful than the baseline Macbook Pro which has an Intel Core i5 inside. Let that sink in. This was tested using Geekbench and the A11 beat the Intel Core i5 in multi core performance. The i5 swung back in single core performance but only beat the A11 by the smallest of margins. Impressive as it is, keep in mind though that benchmarks do not tell the whole story. Qualcomm’s Snapdragon 835 is the SoC which powers most Android flagships from 2017. All the way from the Galaxy S8 to the One Plus 5T. The 835 is really powerful too but has nothing on the A11 when it comes to benchmark tests. It however is powerful enough to provide the smoothest of performances on the devices it powers. We have seen it’s performance in the Pixel 2 XL in particular where it offers the smoothest, butteriest performance on a phone ever. I tell you, the Pixel runs smoother than the latest iPhones. Even the Samsung Galaxy Note 8, powered by the same Snapdragon 835 SoC beat out the iPhone X, which is powered by the A11 in a speed test. Now that’s something we did not think we would see. Now some computer manufactures saw the Snapdragon 835 last whole days in Android phones and got jealous. Thing is laptop battery life is constantly improving but we still are years away from laptops being always on for as long as smartphones. It’s years away unless we use those smartphone processors. At Qualcomm’s Tech Summit held just over a week ago, several Always Connected PCs were revealed. 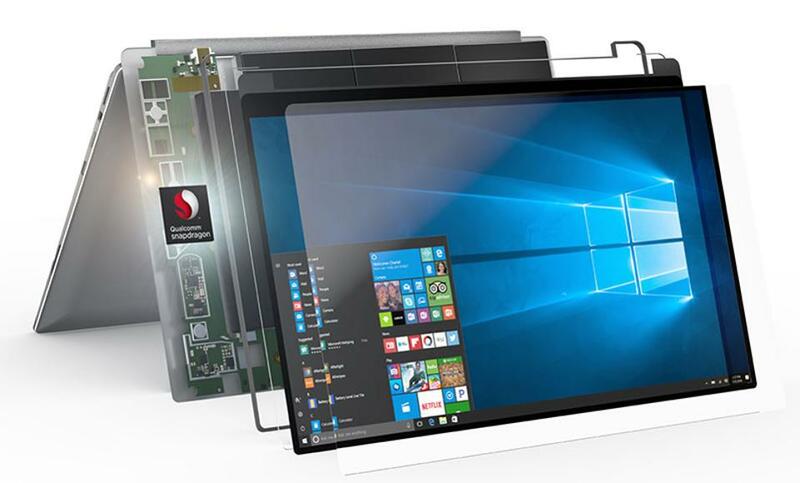 The PCs are powered by the Snapdragon 835 and run full Windows 10. Full Windows 10 means just that, not some reduced functionality OS. The laptops can run any software developed for Windows. So the Always Connected PCs have battery life of over 20 hours active use and up to 30 hours of standby to instant-on utility. Microsoft says the screen is instantly on, there is no wake-delay. They won’t perform as well as something like the Intel Core i7 would but Microsoft say the laptops are fast and responsive. Qualcomm themselves said they are not looking to compete with what the PC is today but are rather trying to make a PC more like a samrtphone. Two laptops powered by the Snapdragon 835, the Asus NovaGo and the HP Envy x2 were shown off at the Tech Summit. Both laptops start at US$599. Tech reviewers who tested the laptops say they indeed felt responsive and seem capable of running some intensive applications. At that same event Qualcomm announced the successor to the Snapdragon 835: the Snapdragon 845. The 845 will bring improved performance, better power efficiency, and improved image processing. It’s almost given that most flagship Android phones for 2018 will be powered by the 845, starting with the Galaxy S9 in the first half of 2018. Reports already claim that Windows laptops powered by the 845 will be available from second half of 2018. These are crazy times we are living in and I love it. With all this computing power, Microsoft has been a big let down in desktop innovation. Windows 10 has failed to take advantage of internet connectivity and AI. The PC of today should have been a smart and an AI marvel capable of so many AI tasks. Up to now, the desktop is just like what it was in 1998. Its outrageous. But again this is what monopoly does, it kills innovation. Mobile computing has grown maybe 10 times since 2007 and yet desktop computing now lags behind. Honestly Microsoft has let the world down.